American author and political activist. Deaf and blind from the age of 19 months and without language, she was taught to speak, communicate and read by her teacher, Anne Sullivan, the story of which was told in the film 'The Miracle Worker'. 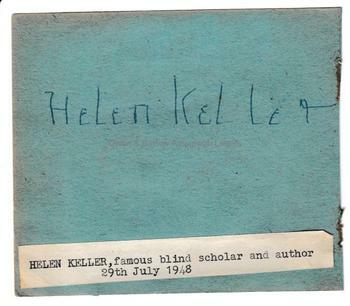 Autograph signature of Helen Keller on a leaf from an autograph album, with an attached note indicating that this was obtained on 29th July 1948. 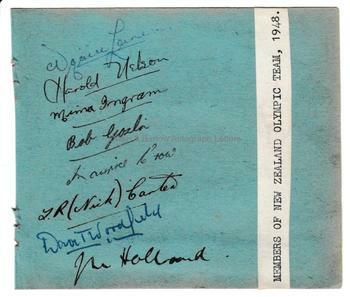 The verso of the leaf has 8 autographs of members of the New Zealand Olympic team, 1948. In July 1948 Helen Keller was on a tour to Queensland, Australia, where she visited the Queensland Adult Deaf and Dumb Mission in Brisbane. It is probable that the autograph was obtained during this visit.